The very senseless murder of Washington Post journalist Jamal Kashoggi which sparked an international outcry also raised concerns over the vulnerable state which journalists all over the world put themselves in when they hunt for stories threatening the interests of criminals and corrupt officials. If the law enforcement agencies and the judiciary systems are in thrall to crime, there is no one to protect journalists. 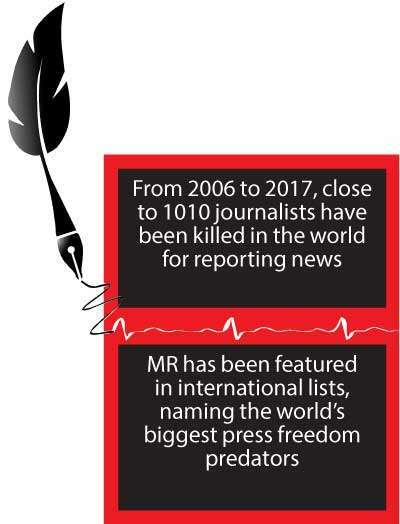 According to the UNESCO, during the past 12 years (2006-2017) close to 1010 journalists have been killed in the world for reporting news and feeding the public with information. In nine out of ten cases the killers go unpunished. Even if, on a very rare occasion, an investigation was completed, only low-level associates were caught. The big fish usually get away thanks to political influence, wealth or intimidation. The United Nations General Assembly proclaimed 2 November (today) as the ‘International Day to End Impunity for Crimes against Journalists’ in 2013. The date was chosen in commemoration of the assassination of two French journalists in Mali on 2 November 2013. The issue is not confined to one region. Journalists in the Asian region have also faced severe threats and harassment just for doing their jobs. 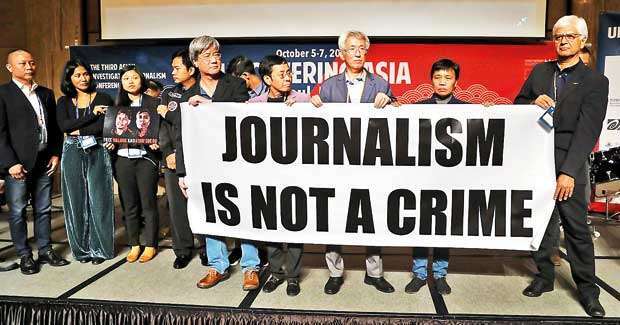 Asia has seen courageous journalists covering corruption, crime, trafficking, politics, business and human rights have been targeted. In 2017, the UNESCO documented the largest number of fatal attacks (27 killings) that took place in Asia and the Pacific region, representing 34 per cent of the total. When it comes to Sri Lanka, ranked 131 in the 2018 World Press Freedom Index, starting from former chairman of Independent Television Network (ITN) Thevis Guruge, who was killed in 1989 to former Editor of the Sunday Leader Lasantha Wickrematunge who was shot dead in 2009 in Colombo, there are hundreds of journalists, bloggers and writers who have been murdered, harassed and threatened. During the UNESCO Regional Conference to End Impunity of Crimes against Journalists last year in Colombo, Editor of the Jaffna based Uthayan, Thevanayagam Premanath, said that there have been 35 incidents of attacks, intimidations and harassments between 2005 and 2013 by military and unidentified groups targeting Uthayan. However, he said that none of the cases has been investigated into properly or investigated. Despite promises that President Maithripala Sirisena made to end impunity for crimes against journalists in Sri Lanka during his presidential election campaign in 2015, almost all the violent crimes against journalists have gone without culprits being unpunished. It is in such a disappointing atmosphere that people hear of the news of Mahinda Rajapaksa – who was featured prominently in the many international lists naming the world’s biggest press freedom predators during the two terms he had as president (as RSF described him in 2008) – swearing in as the Prime Minister of Sri Lanka. Just minutes after Rajapaksa was sworn in as prime minister, supporters of his party, Sri Lanka Podujana Peramuna (SLPP), invaded the newsrooms of various state media. They took control of the two public service TV channels, Rupavahini and ITN, the radio stations that are part of the Sri Lanka Broadcasting Corporation, and the Lake House press group. The ongoing power struggle between Rajapaksa, Ranil Wickremesinghe and President Maithripala Sirisena has put the country’s journalists in a vulnerable state. The take-over of state media soon after Rajapaksa was sworn in as premier was condemned by many journalists’ organizations including the Reporters Without Borders (RSF) and the International Federation of Journalists (IFJ). Press-freedom organisations and organisations established for the journalists can also do more to end impunity. Global Investigative Journalism Network (GIJN) is also one of the organizations that has totally understood its role and the responsibility. 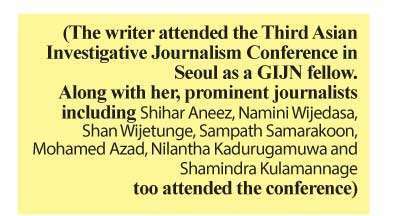 Safety of journalists was the key topic discussed at several panels among more than 60 sessions during the recently concluded Third Asian Investigative Journalism Conference in Seoul, South Korea. The 3rd Asian Investigative Journalism Conference ‘Uncovering Asia’, jointly organised by Global Investigative Journalism Network (GIJN), the Korea Center for Investigative Journalism (Newstapa) and the Konrad-Adenauer-Stiftung, was attended by a total of 440 journalists from 48 countries convened in Seoul, Korea from October 4-7, 2018. According to the organisers the event attracted the participation of the largest ever gathering of investigative journalists in the region. "Just minutes after Rajapaksa was sworn in as premier supporters of SLPP invaded the newsrooms of various state media"
The opening session of the conference was ‘Dealing with the New Threats’ chaired by the co-founder and editor-in-chief of Malaysia’s Malaysiakini Steven Gan, Managing Editor of India’s NDTV Sreenivasan Jain, founder and executive director of the Indonesian Association for Media Development Eni Mulia, CEO and executive editor of the Philippines’ Rappler Maria Ressa, academic dean of the Graduate School of Journalism at Columbia University Sheila Coronel and senior journalist of Dawn Newspaper, Pakistan Zaffar Abbas. Meanwhile, Maria Ressa of the Philippines said that as independent media is under siege in Asia and around the world, the time is rife to fight repression and initiate action. There was another session titled ‘Dealing with the Threats – Both Off and Online’. Umar Cheema, a Pakistani journalist who was captured and tortured while working on a story that would have discredited the Government was one of the journalists who shared his experience during the session with the attendees. “I did a good job! It was worth it! Those words helped me to stay strong during torture. They didn’t want me to talk about what they did. But that was the first thing I did afterwards. Otherwise, they would have threatened me over a lifetime,”Cheema said. Indonesian freelance journalist Febriana Firdaus said that freelance journalists like her are compelled to take their own risks. “Even if your editor says he will help you out, don’t have any expectations,” says Firdaus. Firdaus was expelled from an official meeting with former military offices for writing about Indonesia’s mass killings of 1965. Still she is given her own security protocol with threats against her going viral in 2016 and 2017. Representing Myanmar, Aung Naing Soe, who was working in different ethnic areas in Myanmar and had been jailed for his work, shared his unpleasant experience with the journalists and the participants. “I had been held in Yamethin prison, near the capital city of Naypyitaw, since October, along with three other colleagues, after being arrested for filming with a drone. We were sentenced to two months’ jail under legislation dating to 1934,” Naing Soe said. While in detention Myanmar Buddhist nationalists slandered him online, accusing him of being linked to Islamic terrorists. “Luckily, there was no sensitive data on my computer or my cell phone. However, I don’t really believe that I was arrested for operating with a drone,” he stated. Wa Lone and Kyaw Soe Oo are currently in jail in Yangon in a landmark case that has prompted international outrage. 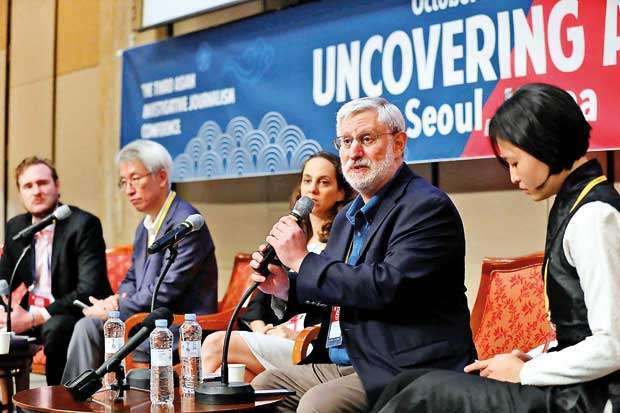 “It’s a sad commentary on where the world is that we have far too many panels at this conference devoted to dealing with the harassment, hate and violence directed at journalists,” Reuters News chief operating officer Reg Chua told participants. He also said that 42 journalists have been killed this year and a record 262 imprisoned last year. Chua said that in some dangerous cases, neither the editor nor the journalist decides whether a story finally gets carried from a certain point onwards. Meanwhile, the keynote at the gala dinner, which was part of ‘Uncovering Asia’, was one of the main events that every journalist was awaiting. The reason was the keynote delivered by award-winning Malaysian political cartoonist Zulkiflee Anwar Ulhaque- who uses the pen name Zunar. He was repeatedly targeted under the former Government of Malaysia for his cartoons, which often mocked former Prime Minister Najib Razak and his wife, fond of luxuries. Some of his collections were banned. "Reporters who risk their own lives for the sake of the people are heroes of our time"
He was hit with nine counts of sedition in 2015, stemming not from his artistic work, but Twitter criticism about the jailing of then opposition leader Anwar Ibrahim. The award-winning cartoonist, who suffered years of persecution, has also faced arrests, travel bans and sedition charges. However, after the change of regime, charges against him have been dropped and the former Prime Minister Razak is facing the possibility of imprisonment for corruption. Delivering his keynote at the conference, he recalled the unpleasant experience he had had, but did not forget to make everyone laugh using his sense of humour. “The police informed me that they had bugged my phone, I said thank you very much because every day I can say a four-letter word to the police. For me, if you cannot beat them, laugh at them. No dictator in the world can stand it if you keep laughing at them…until one day they introduce an anti-laughter law,” he said bringing waves of laughter around the conference hall. Zunar said that he had switched from political cartoons to cartoons for the people and even removed the copyright of his cartoons and told people to go ahead and use it. “My talent is not a gift, it is my responsibility. 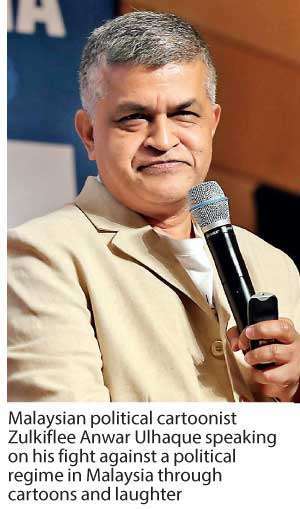 It is my duty as a cartoonist and journalists to expose corruption,” he noted. He also stated that cartoonists and journalists alike, in ‘jail-friendly jobs,’ have to take a stand and do their best when faced with corrupt dictators. Zunar added that freedom of expression being the fundamental right of specially journalists and cartoonists like him, the right has to be fought for since no government would give it freely. The role of the media- which in a democracy is referred to as the Fourth Estate-is to keep voters in a democratic country informed by investigating and reporting on issues that politicians and other powerful interests would prefer were not exposed. The country’s leaders should do their utmost to prevent violence against journalists and media workers, to ensure accountability, bring to justice perpetrators of crimes against journalists and media workers, ensure that victims have access to appropriate remedies, promote a safe and enabling the right environment for journalists to perform their work independently and without undue interference.